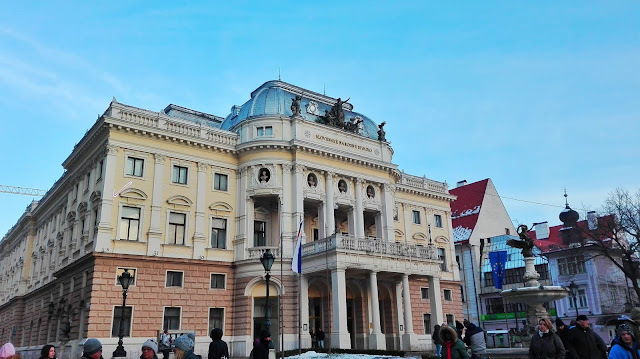 Last weekend I enjoyed a girls weekend with a good friend in Bratislava. 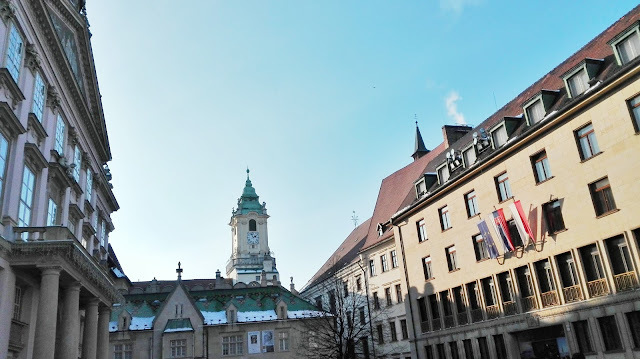 Actually I had never been to that city before, although it is not far from Vienna and also from my hometown. 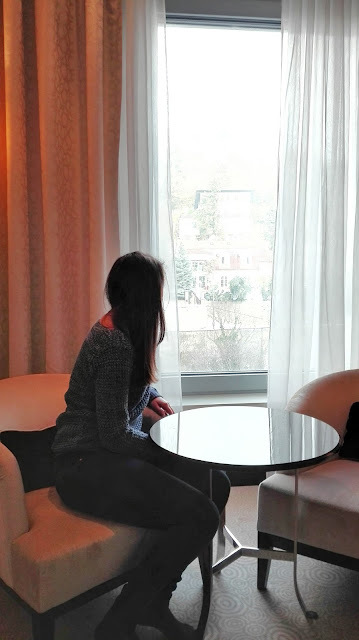 But some time ago I won a short stay at a hotel in Bratislava, so I thought it would be the perfect possibility for a short getaway with a friend, who also had a lot of stress lately. We enjoyed a wonderful stay there, although it was really freezing cold. There are several ways to get to Bratislava. It´s for example only 55 minutes by car from Vienna, but you can also take the train or the bus, which is very comfy and cheap. We decided to take the train as it departs from my hometown and only needs a short time to get there. We arrived in Bratislava-Petrzalka, where many trains from Vienna arrive, and took the bus to get to our hotel. The public transport was really cheap in Bratislava, because you pay not for the distance you drive but per a certain amount of time (for 15 minutes it was 0,70 €). As already mentioned I´ve won a one-night-stay some time ago, which we could only make use of at that specific date. 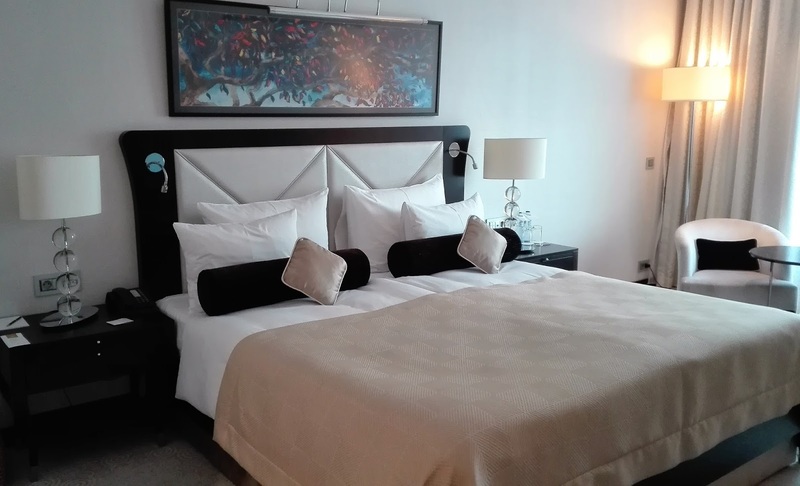 Therefor we stayed at the Grand River Park Hotel Bratislava, a 5 star hotel ( it was my first time at a 5-star hotel) with beautiful and big rooms and a very relaxing SPA area. So if you want a relaxing vacation, this place it great to stay at. 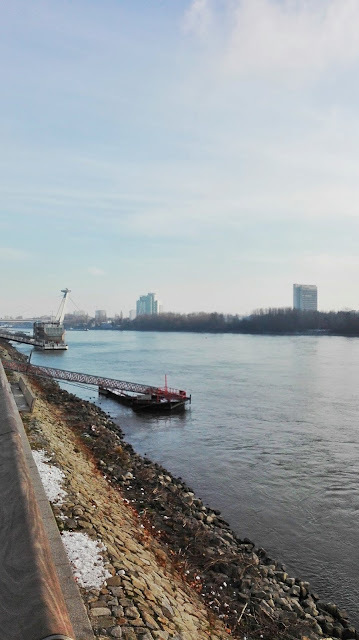 It´s located directly at the shore of the danube, so you have a great area and also some restaurants around, but you need about 10 minutes to get to the city center by tram or bus. As it was christmas time, we decided to visit some of the cities christmas markets. We started at the station Namestie SNP and walked towards the city. At first we visited the one at Hlavne namestie , which is really a pretty place with many historical buildings and nice restaurants around. The christmas market offered a lot of food and beverage huts, but also traditional slowakian goods. It was really crowded, because a show of a folk dance group took place at the stage in the middle of the square. All in all I liked that christmas market. Another one was on our way back to the tram station, which was way smaller but also nice to see. Vis-a-vis of the slowakian national theater there is also a huge area with a christmas market, which was less crowded than the other ones, bu there was also a lot to see. After our cold christmas market visits we decided to take the tram back to our hotel to enjoy the SPA area and had a good dinner, right next to our hotel. As we were really tired afterwards, we watched a movie later and went to bed. 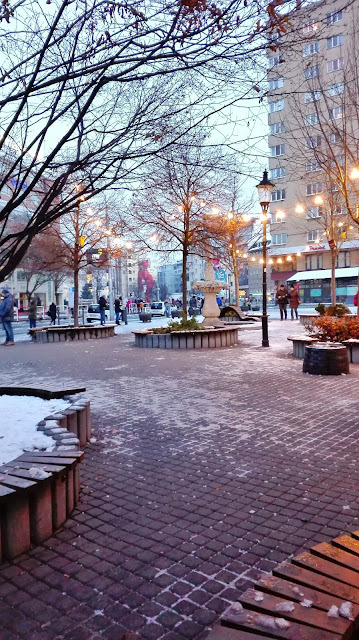 Due to the cold weather we decided to have lunch in a restaurant instead of buying some food at the christmas market, therefore we decided to go to the Cafe- Cafe Bratislava. A small but super nice restaurant in the city centre with good food and nice prices. As breakfast wasn´t included in the hotelstay, we decided to have breakfast in a coffeeshop or something similar. 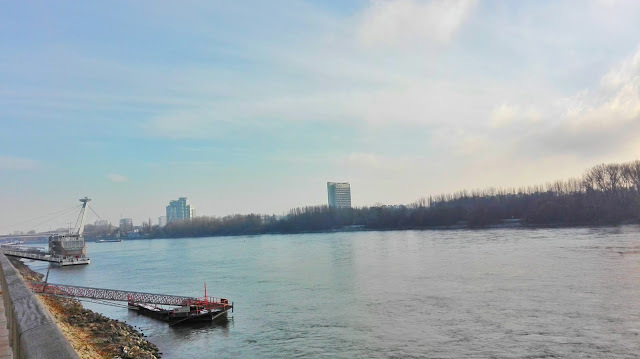 I really hadn´t expected it to be that hard to find a place to have breakfast at on a sunday in an european capital like Bratislava. Every coffeeshop around the hotel was closed, because it was sunday, so we took the bus to the city, but it took us some time to find a place to eat. In the end we went to a small café, which was really nice, but the food was expensive and the breakfast not that good. In conclusion it was a really nice weekend with a good friend, but if it would have been not the coldest weekend since autumn started, it would for sure been even better. 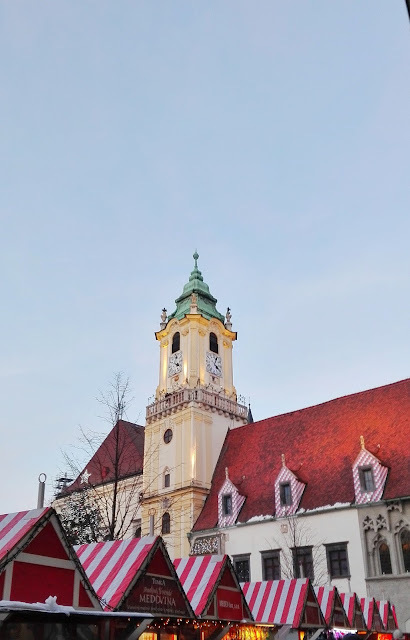 Maybe I´ll visit this city again one day when it´s warmer, so that I can explore more of these beautiful historic buildings and old streets in Bratislava. Have you ever been to Bratislava? 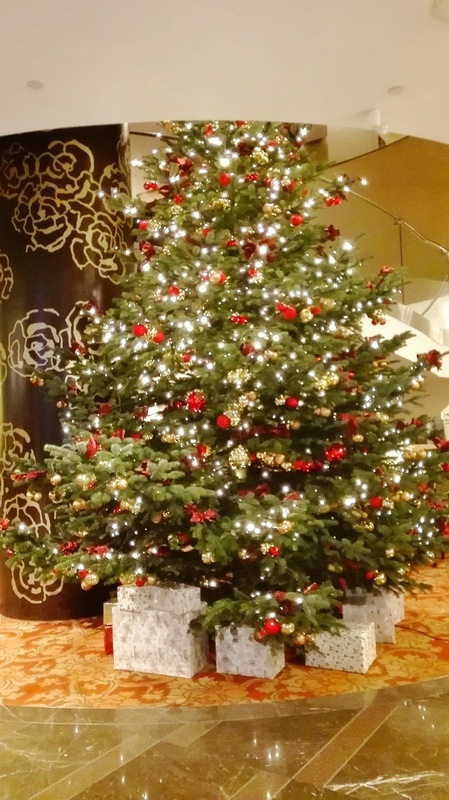 Do you also like to travel at christmas time? sieht nach einer tollen Zeit aus! Wir hatten wirklich eine tolle Zeit dort.